Recep Tayyip Erdoğan, the prime minister of Turkey. Recep Tayyip Erdoğan, the prime minister of Turkey, has been a subject of international dispute since his party won power in 2002. Is he the Muslim equivalent of a Christian Democrat, with politics informed by his faith but not more than that? Or is he an Islamist who learned how to mask his views so as to win the backing of the Turkish electorate, the sufferance of the Turkish military, and the admiration of the outside world? Today comes news of a statement Erdoğan made on January 4, speaking at a election campaign event in Anatolia. Concerning the hostilities in and around Gaza, Erdoğan said Israel was "perpetrating inhuman actions which would bring it to self-destruction. Allah will sooner or later punish those who transgress the rights of innocents." Jan. 13, 2009 update: Bared once, the fangs the reappear more easily. Last time it was the wrath of God, this time, Erdoğan indulged in plain antisemitism, announcing that "media outlets supported by Jews are disseminating false reports on what happens in Gaza, finding unfounded excuses to justify targeting of schools, mosques and hospitals." Mr. Erdogan's rhetoric, meanwhile, has reached Islamist fever pitch. Earlier this month he suggested that "Allah would punish Israel" for attacking Hamas, and that Jerusalem's actions would lead to its own "destruction." On Jan. 16, he questioned whether the Jewish state should still be allowed in the U.N. While accusing Israel of deliberately attacking civilians, Mr. Erdogan claimed that "Hamas's rockets are not causing any casualties in Israel." His attacks worked. After Mr. Erdogan bashed Israel almost daily on national TV since the beginning of the operations in Gaza, 200,000 Turks showed up on Jan. 4 in the freezing rain in Istanbul, calling for the "death" of the Jewish state. Pro-AKP papers, meanwhile, question Turkey's military cooperation with Israel. Now, Turkey's tiny and well-integrated Jewish community feels physically threatened for the first time since 1492, when it found safe haven in the Ottoman Empire after fleeing the Spanish Inquisition. There have been threats of violence against Jews and, even more shocking, banners have been plastered on Jewish-owned businesses, asking people to boycott them. Erdogan's seemingly spontaneous outburst was a carefully considered move in Turkey's internal power struggle between the ruling Islamist party AKP and the opposing military establishment, and highlights a major shift in the country's balance of power. … [The] attacks on Israel fall within the new phase of seeking out open confrontation with Turkey's secular watchdogs. … It should be understood that the key aspect of Erdogan's attacks on Israel is not just in uniting the Turkish public behind him, but in uniting them against the military and the secular establishment. attacked Erdoğan for what the Turkish leader imputed to President Shimon Peres at another international conference, the World Economic Forum in Davos. Paraphrasing from Scriptures, he called on Erdoğan to look in the mirror. He did not leave it at a clear allusion to the massacre of the Armenians and the suppression of the Kurds, but mentioned the Turkish occupation of northern Cyprus as well. In response to Erdoğan's call for Israel to be expelled from the United Nations, Mizrahi suggested that Turkey should be paired with Israel on such an occasion. Prior to the war in Gaza, Turkey was basking in "neo-Ottmanism," a new "golden era" of Turkish diplomacy. Turkey was mediating between Israel and Syria and proposed to mediate between Iran and the United States. Earlier, in the summer of 2008, Turkey had thrust itself forward as a mediator between Georgia and Russia. As for Gaza, the ramified contacts of Turkey with Israel, and Turkey's ties to Hamas, seemed to make Turkey an ideal mediator between Israel and the Palestinian Islamists (especially given the deterioration in Hamas's relations with the other possible mediator, Egypt). What could have been more natural than Turkish diplomacy marching into the breach to solve the brewing Gaza crisis? Foreign ministers, officials, and special envoys from all over the Middle East and beyond seemed to agree, and flocked to Ankara for consultations. Erdoğan himself paid visits to the region's capitals (but not to Jerusalem), hoping to find a solution. But then Israel, by its military operation in Gaza, spoiled the illusion and deprived Turkey of the coveted status of optimal peacemaker. Mar. 13, 2009 update: My title about Erdoğan's baring his fangs is, of course, metaphorical, not literal. But it appears that the prime minister literally bared his fingernails on a March 9 campaign visit to the city of Adana. Erdoğan's fingers at the ready. I was immediately stopped by the escorting officers who brought me before him. The prime minister put one hand on my neck and, pushing me roughly, scratched me with his nails asking me: "Why did you shout those things?" I answered him, "My father lost his job recently because of the economic crisis." Then he let me go." According to one account, the back of the boy's neck had a red 5-centimeter bruise that indicated "deep nail-scratches." Armed with a doctor's report, the boy's family has lodged a complaint accusing Erdoğan of injuring him. Comment: This incident exposes, yet again, the innate thuggishness of Islamists, even the law-abiding and legitimate ones, even those who make it to the top of the government. 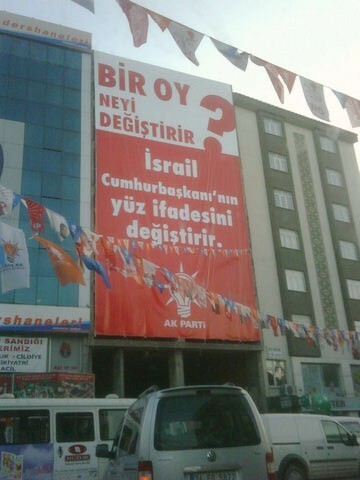 The AK Party's huge anti-Israel campaign poster. Anti-Americanism and anti-Semitism are surging in Turkey because the Justice and Development Party (AKP) government sanctions both phenomena. This combination of anti-Americanism and anti-Semitism is not a coincidence. The Islamist thinking is as follows: The Jews are evil, they run America, and therefore America is evil. Take, for instance, the billboards that Istanbul's AKP government put up during the Gaza war in Istanbul's mixed Muslim-Jewish neighborhoods. These oversized billboards depicted a burnt-out child's sneaker, with a sign saying "humanity is slaughtered in Palestine" over it. Under the sneaker, in large print, the billboard quoted the Old Testament commandment "Thou shall not kill" and added "You cannot be the Children of Moses." What on earth does the Gaza war have to do with Jewish law? Is it an accident that a day after these billboards appeared in Istanbul's cosmopolitan Nisantasi neighborhood, vigilantes distributed fliers calling for a boycott of Jewish businesses? Or that the next day, Jewish businesses in the neighborhood took down their names? The outrage sparked by the Gaza war has failed to subside. In early February, the AKP government of Istanbul opened a cartoon exhibit in the city's downtown Taksim Square metro station—Taksim Square is to Istanbul what Times Square is to New York City—which included many cartons depicting bloodthirsty Israelis killing Palestinians with American help, such as one in which a satanic-looking Israeli soldier with white pupils washes the blood on his hands of a faucet, labeled the United States. Each month, millions of Turks pass through the Taksim metro station—a government-owned public service. Comment: I published my first article about the AKP, "Turkey's Radical Turn?" in August 2003, when I raised the idea that its election had started a process that "could transform Turkey … into an Islamic republic." At that point, I was part of a tiny minority. As the AKP rule lengthens and deepens, I find that minority steadily growing. Apr. 5, 2009 update: An opposition newspaper in Turkey, Hürriyet, reports that nearly ten thousand Israeli tourists have canceled Passover vacations in the Bodrum area of southern Turkey, in large part due to Prime Minister Recep Tayyip Erdoğan's attack on Israeli president Shimon Peres at Davos in January. Some 40 flights were canceled, while flights from Israel to Crete and Varna for the eight-day Passover holiday rose from 4 to 10. Yüksel Aslan, the Aegean region director of Flying Carpet, a tourism company, reports bringing 5,734 Israeli tourists to Turkey in the Passover period last year but just 15 bookings from Israel for this April. The boycott is not entirely spontaneous; a Facebook group calling for a boycott of Turkey (Embargo on Turkey) has more than 5,200 members. Abdullah Gul, the president of Turkey, welcomes Mahmoud Abbas to Ankara. July 18, 2009 update: Abdullah Gul, the president of Turkey, joined Mahmoud Abbas to open a new Palestinian "embassy" in Ankara today and plant jointly with him a blue spruce tree in front of the building. According to the Ma'an News Agency, the Turkish government partly paid for the new offices and Gul proclaimed that "Turkey hopes someday to open its embassy to Palestine in East Jerusalem." Abbas hailed the celebration as a "symbol of friendship and brotherhood" between "Palestine" and Turkey. According to WAFA, "Turkish officials decided to build a university hospital, a new industry zone in Palestine and a congress center in Ramallah." Nov. 8, 2009 update: Erdoğan gratuitiously turned the screw against Binyamin Netanyahu while apologizing for the genocidal murderer who rules the Sudan, Omar Hassan al-Bashir: ""I wouldn't be able to speak with Netanyahu so comfortably but I would speak comfortably with Bashir. I say comfortably 'What you've done is wrong.' And I would say it to his face. Why? Because a Muslim couldn't do such things. A Muslim could not commit genocide." 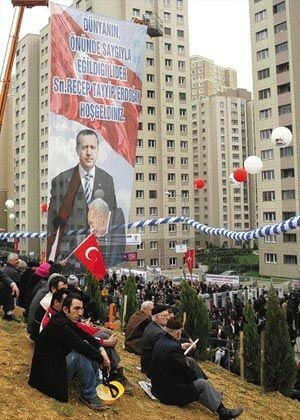 Feb. 21, 2010 update: A Turkish newspaper carried this picture today, of a campaign rally with a poster of Erdoğan lording it over Peres in a collage bearing the words ""Welcome honorable Tayyip Erdoğan – a leader in front of whom the world bows with respect." Recep Tayyip Erdoğan lords it over Shimon Peres in a campign picture. Mar. 7, 2010 update: The Saudi paper Al-Watan quotes Erdoğan announcing that that al-Aqsa Mosque, the Cave of the Patriarchs and Rachel's Tomb "were not and never will be Jewish sites, but Islamic sites." He also said that "Palestine [was] always at the top of Turkey's priorities" and that he "loves my brothers in Fatah and my brothers in Hamas to the same degree, because they are my Muslim brothers and I cannot distinguish between them." May 31, 2010 update: With today's Turkish-government-sponsored "Free Gaza" flotilla incident, the world knows who Erdoğan is, so the work of this weblog is done and it can be closed down. May 31, 2013 update: Exactly three years later, Erdoğan's crackdown on peaceful protestors in Gezi Park, Istanbul, again makes the world aware of his rude and nasty nature.